Qualifications: Post-graduate / Graduate Engineers in Mechanical / Production discipline, with a first class academic record throughout. Experience: Graduates: 2-6 years. Diploma Engineers: 4-9 years. 2D / 3D CAD experience in l-DEAS & Pro-E-Wildfire, Unigraphics-NX. GD&T knowledge, essential. Good communication skills and leadership qualities, essential. Preferred: Working knowledge of Windchill / PDM tool, exposure to sheet metal enclosure and plastic components domain and hands-on experience in industry. Location: Baroda (Gujarat) and Mumbai (Maharashtra). 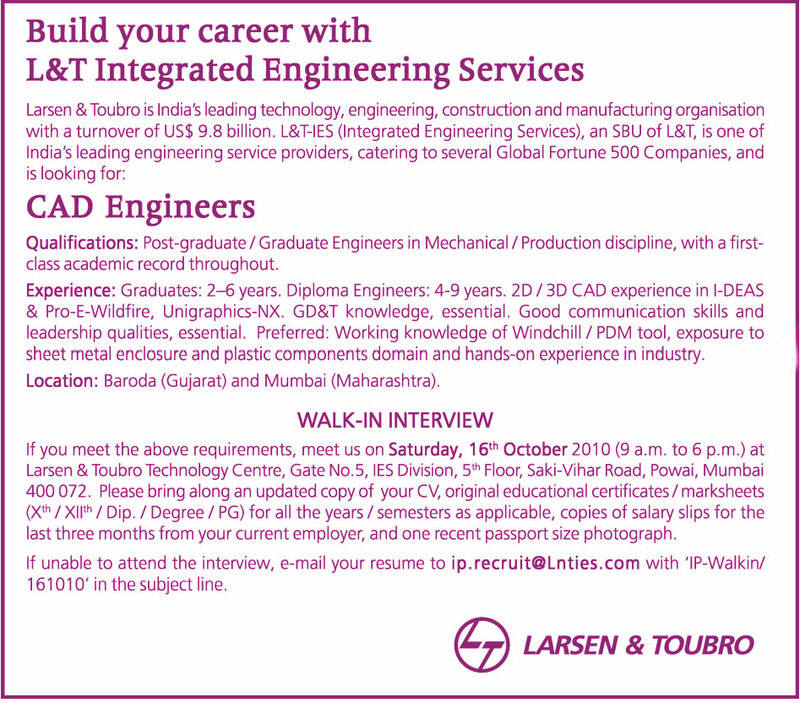 If you meet the above requirements, meet us on Saturday, 16th October 2010 (9 a.m. to 6 p.m.) at Larsen & Toubro Technology Centre, Gate No.5, IES Division, 5,h Floor, Saki-Vihar Road, Powai, Mumbai 400 072. Please bring along an updated copy of your CV, original educational certificates / marksheets (X,h / XIIth / Dip. / Degree / PG) for all the years / semesters as applicable, copies of salary slips for the last three months from your current employer, and one recent passport size photograph. If unable to attend the interview, e-mail your resume to iD.recruit@Lnties.com with 'IP-Walkin / 161010' in the subject line.